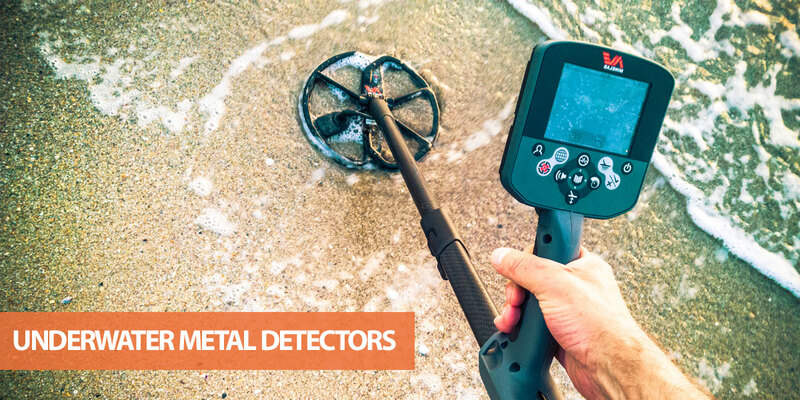 Are you looking for an underwater metal detector? If so, you’re in the right place! Here’s my list of the best underwater metal detectors for both diving and shallow water hunting. Whether you're planning on hunting at the beach, ocean or local river, searching for hidden treasure underwater adds an entirely new dimension to metal detecting. Nothing beats the excitement of pulling a rare relic or gold nugget from a hunting ground most hobbyists don’t even have the equipment to access. Diving with a metal detector is also something I think every hobbyist should experience at least once (even if it’s just with a rental detector and equipment). It’s vital to have a clear understanding of the various waterproof and submersible detectors on the market though. Underwater detectors aren’t cheap, nor are they simple to use, so getting the wrong machine can be a costly mistake. Many of the best metal detectors are also not suitable for underwater hunting. To help you narrow down your search, I’ve put together a list of the best underwater metal detectors. Make sure you read each review carefully, as I’ve included information about the strengths and weaknesses of each detector to help you make an informed choice. Where Will You Use the Detector? Should You Buy Pulse Induction or VLF? Before you can choose an underwater detector, you need to be clear about where you're going to use it. A detector with a waterproof coil that can be used in shallow water but cannot be submerged (most land detectors fall into this category). These detectors are sometimes described as water resistant or weatherproof. A detector with a waterproof coil and control box that can be fully submerged but only to a shallow depth (such as the Garrett AT Pro). These are great for hunting lakes or on beaches but are not suitable for diving. A detector with a waterproof coil and control box that can be fully submerged and is also suitable for diving (such as the Tesoro Sand Shark). These models can be used at depths of up to 200’ or more. To make deciding on the type of detector easier, here's a quick summary of what you might need. Do you want a land detector with the option of hunting shallow river banks? If so, a waterproof coil may be all you need - as long as you're very careful not to get the control box wet. Do you want to hunt in creeks, rivers, lakes or at the shore? In this situation, a fully submersible detector is important, as you never know when a big wave or unexpected fall could put your control box underwater. Do you want a detector for saltwater hunting? If so, check out my beach detectors page for models that can handle saltwater. Or do you want to go scuba diving with your detector? In this case, a fully submersible detector with a high depth rating is essential. Vibrating alerts can also be useful. You also need to consider whether you want the detector to be effective on land too - or if you just want it for underwater detecting. The depth of water is only part of the equation. You also need to consider the mineralization and other conditions of your chosen hunting ground, as this affects the type of metal detector you need. There are two broad categories of metal detector: Very Low Frequency (VLF) and Pulse Induction (PI). As a general rule, pulse induction detectors are the best choice for saltwater hunting, such as beaches or scuba diving. This is because they are unaffected by high levels of mineralization found in wet sand. They also provide excellent sensitivity to valuable metals and great depth. A downside is they don’t provide discrimination, so you’ll need to dig more unwanted targets. VLF detectors are often a cheaper alternative to PI that are less specialized. They have decent sensitivity to jewelry and coins, but struggle to “see” in ground with heavy mineralization. This means they are less suitable for saltwater hunting, but are often great for both land and freshwater locations. While it’s true that the best VLF models have manual ground balance, sensitivity adjustment and other settings to minimize the effects of difficult conditions, they can’t match PI machines when it comes to ignoring mineralization. On the plus side, VLF detectors can discriminate junk targets, so you’ll waste less time. Aside from the type of detector and its waterproof capabilities, there are other factors to consider. These include your budget, experience level, and which accessories you need. Make sure you budget for extra digging tools and scoops, as these can add to the total cost. If you’re looking for a waterproof detector for shallow water hunting, the Garrett AT Pro and Garrett ATX are my top picks. Both are fully submersible to a depth of 10’ and provide excellent performance. Don’t let the similar names fool you though: these are very different detectors. Make sure you read the mini reviews below to find out which is best for your requirements. 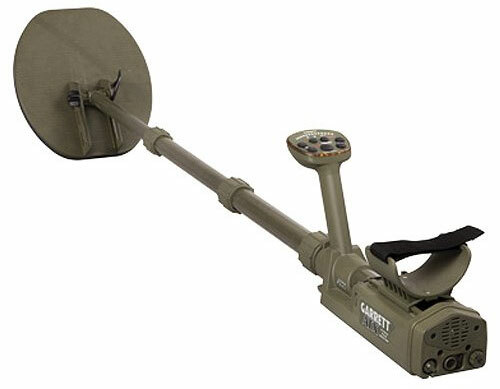 One of my favorite mid-range VLF metal detectors is the Garrett AT Pro. It’s a great all-rounder that’s perfect for hunting coins, jewelry and relics - plus it’s fully submersible down to 10 feet. Let’s start with the basics. The AT Pro is a versatile VLF detector that’s designed to handle almost any type of hunting (aside from diving). It’s great for detecting small coins or jewelry, due to the 15kHz operating frequency, while the manual ground balance and rapid recovery time make it suitable for most environments. Garrett has included two modes with the AT Pro: “Pro” and Standard. The “Pro” mode provides more detailed audio feedback, including estimated depth and target size, while the “Standard” simplifies audio signals which is useful for beginners. Other features include an electronic pinpointer, custom search modes, notch discrimination and a target depth indicator. As a VLF detector, the AT Pro is more prone to chatter in saltwater than PI models. The manual ground balance and notch discrimination mean it can still do a decent job in saltwater though - plus it’s much more suitable to dry land hunting than a PI detector. There are a few drawbacks to the AT Pro though. There’s no true all-metal mode, although the “Zero” search mode provides similar performance. It also doesn’t come with waterproof headphones - you’ll need to buy these separately. 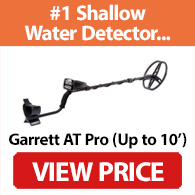 Even so, if you’re looking for a single metal detector for both land and water detecting, the AT Pro is one of the best on the market. It’s a rugged detector that can be used almost anywhere with great results. The fast response time, wide range of adjustable settings, and waterproof design make it an excellent option for shallow water detecting. Want to learn more about the AT Pro? Click here for my full review. The Garrett ATX (not to be confused with the AT Max) is a pricey pulse induction detector that’s built for extreme conditions - including saltwater environments. With its durable design, DD coil and incredible search depth, it’s a fantastic underwater detector that also provides great sensitivity for a PI model. There are two ATX packages. The standard package includes a 10”x12” DD coil, which provides great depth and sensitivity for small items. If you’re after even more depth when searching for larger items, the Deepseeker packages includes a 20” Deepseeker mono search coil. Like the AT Pro, the ATX is waterproof down to a depth of 10 feet. This makes it suitable for shallow water hunting, but not for diving. The pulse induction technology ignores ground mineralization, so it’s perfect for hunting in saltwater or ground with heavy mineralization. Other features include both non-motion and motion modes, manual ground balance, LED signal indicator and Iron Check. Despite having a range of settings, the ATX is simple to use and won’t take a long time to learn. It’s also fully collapsible, which is important if you’re going to be travelling with the detector. The biggest downside to the Garrett ATX is the price. This is an expensive machine - although it justifies the price with a durable design, pulse induction technology and large search coil. It’s also heavy and doesn’t come with waterproof headphones. Despite these issues, the Garrett ATX is a great choice for underwater hunting. It provides excellent depth and sensitivity in both saltwater and freshwater conditions - plus it’s highly durable and will last a long time. If you need a metal detector for scuba diving, it’s important to consider how deep you’re likely to dive. Metal detectors have a depth rating, so check the model is suitable before you buy. Diving below this depth could permanently damage the machine. With that in mind, here are three of the best diving metal detectors that can be used at least 200 feet below the surface. If you’re looking for a pulse induction detector for diving, the Garrett Sea Hunter MkII is my top pick. 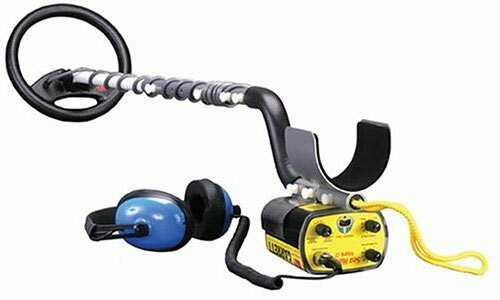 It has an operating depth of up to 200 feet, includes submersible headphones and provides excellent sensitivity. I mentioned earlier that PI detectors can’t discriminate - and that’s usually true. Garrett has included their patented Discrete Trash Elimination mode with the Sea Hunter Mark II, however, which provides a level of trash discrimination not usually found on PI detectors. This means you’ll spend less time digging trash targets, such as pulltabs, without filtering too many valuable targets. Aside from the discrimination function, the Sea Hunter Mark II comes with several search modes, including Non Motion All Metal and Standard PI Discrimination. There are also settings for elimination and audio threshold. Garrett has also designed the Sea Hunter to be suitable for both beach hunting and diving. To achieve this, the detector can be used with both long and short stems and comes with straps for wet suits. There are a few downsides though. There’s no pinpoint mode, for example, which can make it harder to get an accurate target location. The detector also doesn’t provide visual identification. Even so, the Sea Hunter MkII provides great value for money if you want a metal detector for diving. The discrimination function is also a bonus, as it’s not an option most pulse induction detectors can provide. One of the most popular diving metal detectors is the Tesoro Sand Shark. It costs around the same amount as the Sea Hunter MkII and has similar features, including a depth rating of 200 feet and pulse induction technology. As it’s a pulse induction detector, the Sand Shark is great for hunting in wet sand and saltwater environments. The 10-20 battery life isn’t the longest, but should be enough for most hunting sessions. There’s also a drop-in battery compartment to make swapping easier. What makes this detector worthy of a place on this list though? Firstly, the Sand Shark has features and settings not found on all pulse induction models. There is a dial for depth, for example, which adjusts the pulse width. This allows you to change the depth by up to 50% according to the conditions. There are also two operating modes and the ability to change audio frequency. It also provides excellent sensitivity while being easy to use. The pulse induction technology provides plenty of depth, plus the various adjustment settings allow you to customize performance to the environment. 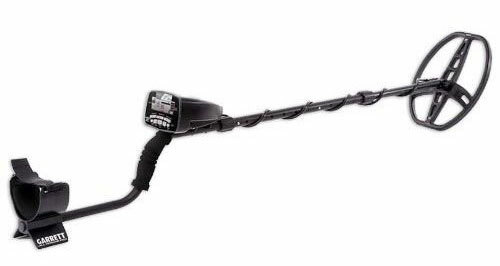 Overall, the Tesoro Sand Shark is an excellent metal detector for beaches or diving. It also provides great value for money and is relatively simple to use. If your dives might go deeper than 200 feet, the Fisher 1280-X Aquanaut is a great alternative to the Sand Shark and Sea Hunter. It can also last for up to 75-hours on a single charge, which is much more than most detectors and handy on longer trips. Unlike the other models in the “diving” section, the Aquanaut is a VLF detector with a low 2.4kHz frequency. It’s more susceptible to interference from wet sand, but has manual ground balance and discrimination to counteract trash and mineralization. An interesting note about the 1280-X is that the circuitry is designed to ignore small trash items. The low frequency also provides greater depth compared to higher frequency VLF models. Other features include a belt mount, waterproof headphones and sensitivity adjustment. If you’re looking for an underwater VLF detector that doesn’t cost a fortune, the 1280-X is one to consider. The 250’ maximum depth means it’s great for diving, while the sensitivity adjustment, manual ground balance and discrimination settings allow you to fine-tune the performance for both saltwater and freshwater environments. Where to Buy a Waterproof Detector? Most retailers that sell metal detectors stock underwater models - at least those for shallow water hunting. You may need to search in a specialist store for diving models, however, such as the Tesoro Sand Shark. It's also worth shopping around for sale prices and discounts, as waterproof detectors can be expensive. Many online retailers, such as Amazon or Walmart, offer great prices and regular deals. If you're thinking of buying a used or second-hand detector, eBay and Craigslist can both be good options. Just make sure you check the condition of the detector and how much it has been used. Underwater metal detecting can be a fun and potentially rewarding hobby - but it’s vital to get the right detector. Just because a detector is advertised as “waterproof” doesn’t mean it’s suitable for underwater hunting, while a “submersible” detector isn’t necessarily built for diving. The key is to know where you’re going to be using the detector. Do you want to hunt in saltwater or freshwater? Are you going to be diving with the machine? If so, how deep are your dives? What’s your budget? Do you want to use the detector on land as well as in water? By considering these questions, you’ll have a much better chance of getting a great detector that meets your requirements. I hope this article has helped you choose the best underwater metal detector for your budget, needs and requirements. If you have any questions, please use the comments form below.